Just as the sun shall rise in the morning and the snow shall fall in winter, there will always be another Marvel film to entertain us and ever since the visceral gut punch that was Avengers: Infinity War, fans have been clamoring for another dose of MCU goodness. Captain Marvel is another addition to Marvel’s ever-growing roster of colorful, crowd-pleasing blockbusters that we seem to get a double dose of every calendar year. On that note, ‘colorful’ and ‘pleasing’ are definitely the two adjectives that best describe its latest addition: Captain Marvel. One place where the film falls flat is that unlike in the MCU films preceding it, the villain is not shockingly interesting. The villain is not terribly acted, but not particularly memorable in terms of dialogue or depth. And definitely not up to snuff with other MCU Villains like Loki, Vulture or Thanos. Speaking of which this film has the distinction of being the first MCU film post Infinity War. 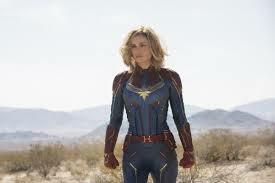 The film does connect back to the post-credits scene of that film and even provides a neat little sneak peek of Avengers: Endgame, but I dare not spoil it here.Captain Marvel might not reach the lofty standards set by the top tier MCU outings that have preceded it, such as Civil War, Guardians or Ragnarok, but it does provide a good story, likable characters, a solid soundtrack and good universe building. Definitely check this one out.